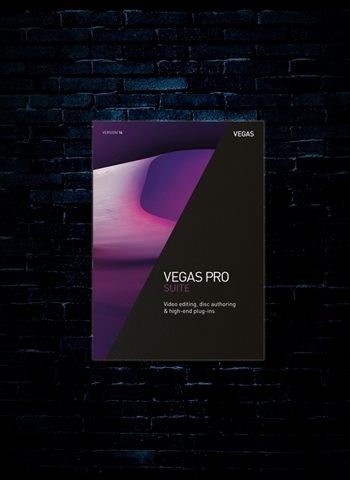 Experience pure creative freedom with VEGAS Pro 14 Suite. The latest version combines intuitive workflows with high-quality plug-ins developed specifically for the needs of visually demanding creative editors and post-production professionals. Realize every project in brilliant quality – without any video format, hardware connectivity or 4K limitations. Sharp images and crystal clear sound: VEGAS Pro 14 Suite supports the latest technologies such as S-Log gamma curve encoding. Additional functions like XAVC support and smart proxy workflows make VEGAS Pro 14 Suite a highly efficient tool for video post-production. Optimize your footage easily and with full control thanks to effect masks, stereoscopic 3D adjustment and multi-camera editing. Remarkable plug-ins for motion tracking, 3D design and compositing offer support for your most demanding projects. With the latest plug-in version, you can rescue material even with strong shaking or vibrations. The video stabilization optimizes individual CMOS errors such as Jello, Wobble, Skew and Distortions – as well as various combinations of these. Thanks to the wider angle, this powerful engine is vastly superior to internal camera solutions in many ways. Create dynamic titles and text dissolves with the help of more than 40 templates or work completely from scratch. Import PSD files and bring titles to life as 2D and 3D animations. Make a statement with VEGAS Pro 14 Suite. For the right mood in every image. With video effects such as Film Color, Color Fixer Pro, Gradient Tint, Spotlight and Glow Pro from NewBlueFX give your recordings that special look. Finalize your projects with VEGAS DVD Architect: Thanks to convincing layouts and impressive designs, you can create professional menus for DVD and Blu-ray Discs. Import your own graphics from Photoshop for customized backgrounds, buttons and overlays. Define individual chapters of your movie by simply setting markers. Finally, take full control of the encoder settings.